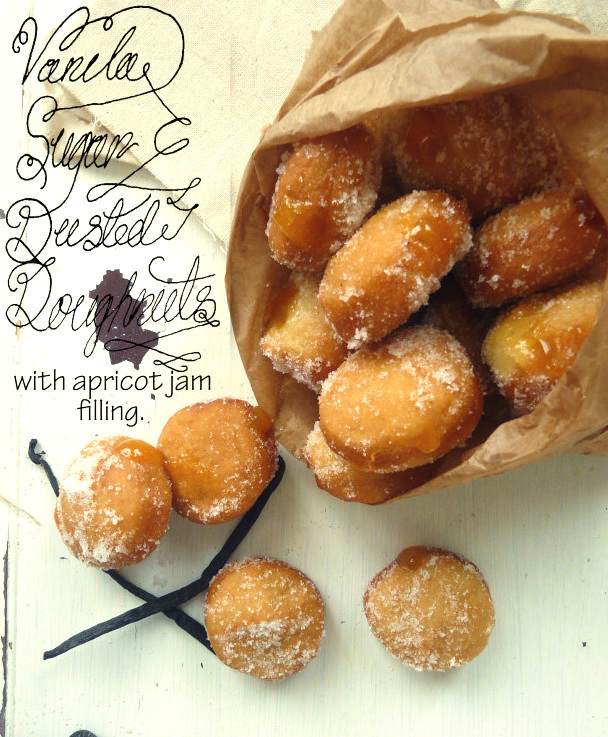 Deliciously doughy apricot doughnuts, filled with apricot jam, and covered in a generous coating of vanilla sugar. To make the vanilla sugar, pulse the vanilla seeds with the sugar in a food processor and store in a jar. Grab a sauce pan and gently heat the vegan mylk and margarine together until the margarine is melted, dissolve the sugar into the liquids, remove from heat and allow to cool until the mix is tepid. Whisk in the yeast and add to the flour. Part mix then add the salt. Knead a little in the bowl to bring the dough together then transfer to a floured surface and knead for about 8-10 minutes, until smooth and elastic, adding more flour as needed. Grease a bowl with vegetable oil and toss the dough gently in the oil to coat, cover with cling film and leave somewhere warm for about 1-2 hrs until slightly more than doubled in size. Pop the dough in the fridge over night- or at least 8 hours- and take the dough out the fridge and roll carefully out to 1/2″ thick on a floured surface. Using a 2″ cutter cut out little circles of dough and place on a lined baking sheet to prove for about 1 1/2 hours- 2 hours, until the dough has doubled back up. Grab a large pan and fill with the 1 litre of vegetable oil, and preheat the oil to about 160c/325f. Make sure you have a bowl filled with a small amount of vanilla sugar, and a bowl lined with paper towels to absorb the excess oil. Pop a few bits of dough in the pan at a time and fry until golden brown on one side, then carefully flip and fry the other side. Using a slotted spoon lift the doughnuts out of the oil, draining off some of the excess, and toss about in the bowl of vanilla sugar, then transfer to the bowl lined with paper towels. Repeat until all the doughnuts have been fried and sugar-coated. Once to doughnuts are cool enough to handle fill with apricot jam using either a doughnut filler, or a piping bag fitted with a long metal nozzle. 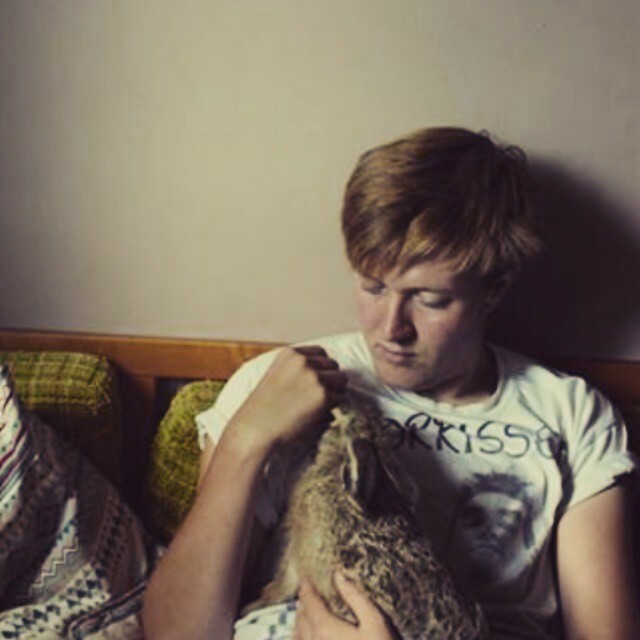 Alexander lives by the sea in England, and is the son of both a baker and a chef. Growing up, many of his happy memories were food related, but he never really explored cooking by himself until he became vegan. He wants to show people how to eat tasty, healthy and nutritious food, and how to make vegetables incredibly tasty! For more inspiring vegan recipes, please visit Alexander’s website, www.invegetableswetrust.com.